Our individual location is a very powerful signal to use for personalisation. We all feel connected to where we live, where we work, where we grew up, and ads that can smartly use our location have the opportunity to really connect with us. In its most basic form, an ad that simply mentions which city or town we are closest to can feel more familiar to us. How about the ad that mentions a nearby landmark that everybody knows: your closest train station, monument, park or motorway? To give audio producers and creatives the flexibility to use any of these techniques we have built location in to our Studio as one of the rules. When you select this rule, you can choose a centre point and a radius within which to locate each user. Use the search box over the map to quickly find places using Google Maps, and we automatically suggest a radius based on the city boundaries. To consider whether a user is within this radius, we have to consider the accuracy of the user's location. We get approximate location of the user from their IP address (the unique address that each internet-connected device is given) that discloses the rough location of that device, along with an accuracy score of how confident we are about that location. This is called the accuracy radius (lower is more accurate). So, to consider the user to be within a location, we take the distance between the location's centre point and the user's centre point and add the accuracy radius. If that is less than the location's radius, then we consider this user within that location. The illustration below shows this. Nottingham is the location's centre point with a location radius of 12km. 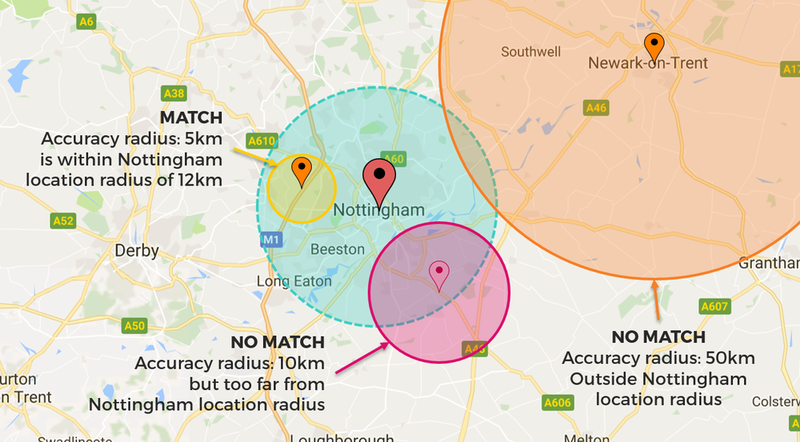 Only the Yellow point is matched because both it's centre point and it's accuracy radius is within Nottingham's area. 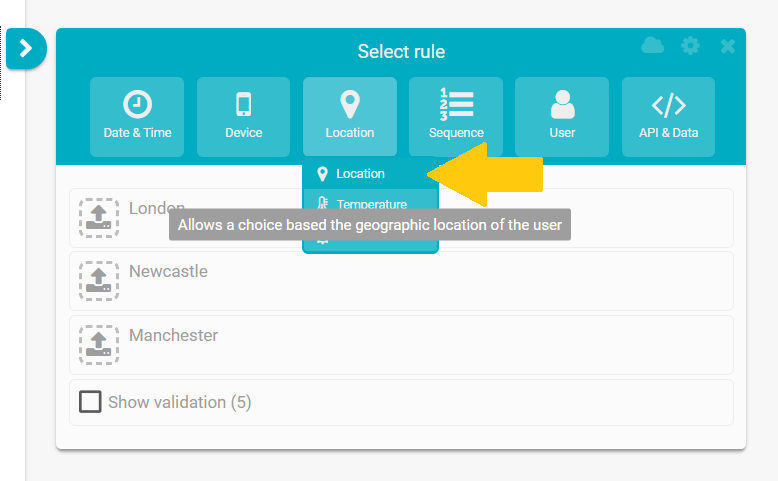 We check each user against each location in a script using the above calculation and, if the user is not within any of the locations, we return the default. If the user can be located in more than one radius then we pick the closest distance. If the distance is exactly the same, we pick the smallest radius. When we look at the accuracy radius of a sample set of IP addresses for impressions served in the UK, we can plot the proportion of those IPs and the accuracy. As the chart below shows, approximately 55% of users have an accuracy radius of 20km or less. Radii can overlap or be concentric to create nice effects like a waterfall of city to region to country. For script writers, we recommend not trying to get too micro with location - city level is best. This can be great for a retailer whose has one or two stores per city - see the map below that shows the centre points and radii of a well known UK store chain. This way of working with location inherently means that there are some users on some connections whose location we just don't know, or their accuracy is so low that it is useless. In these instances we revert to the default. In the future more devices will report their location more accurately using the GPS or aGPS of their device and we will be able to achieve more creative executions, such as navigation and location history. There are some great tools online to help understand location and convert between post codes, addresses and lat,long coordinates. We really like BatchGeo, Doogal and Batch Postcode Finder.